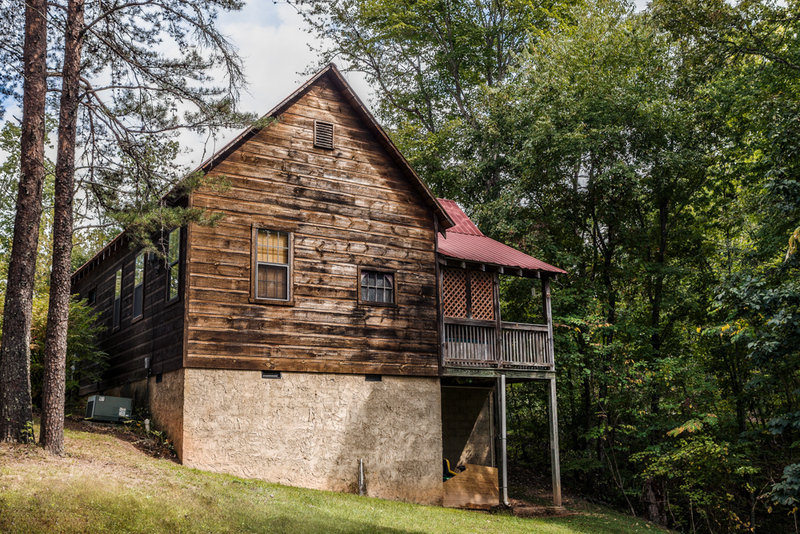 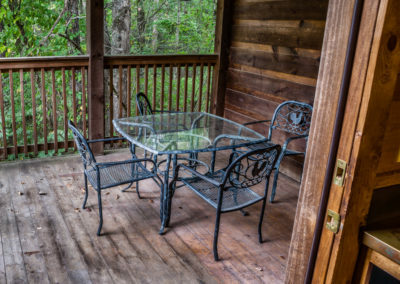 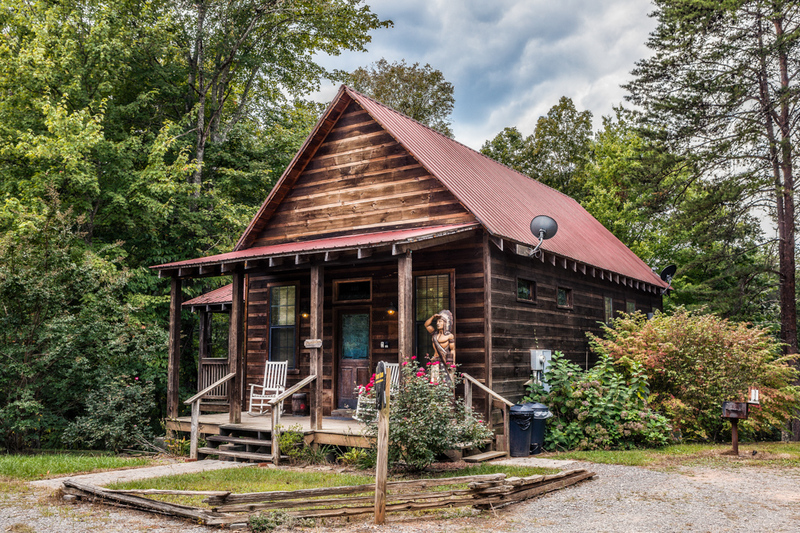 Location: This Cabin is located just right, only a mile from the Parkway at Red light number 10 – easy access to DollyWood and Gatlinburg. 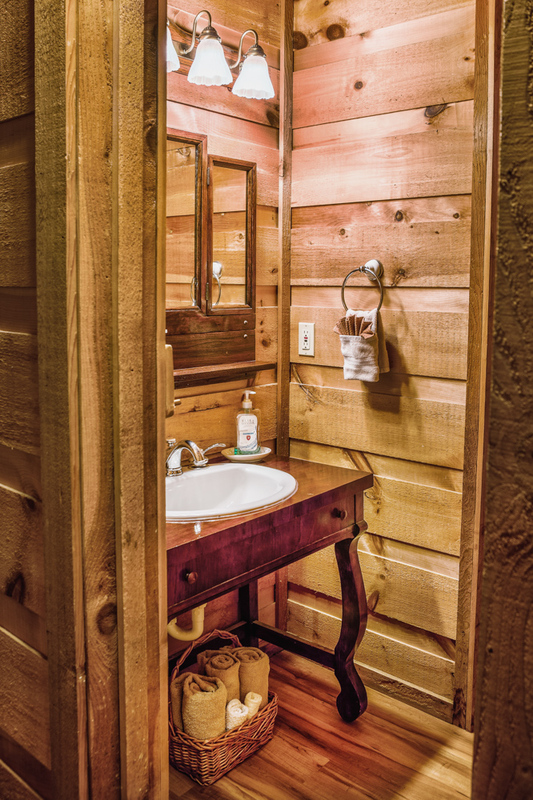 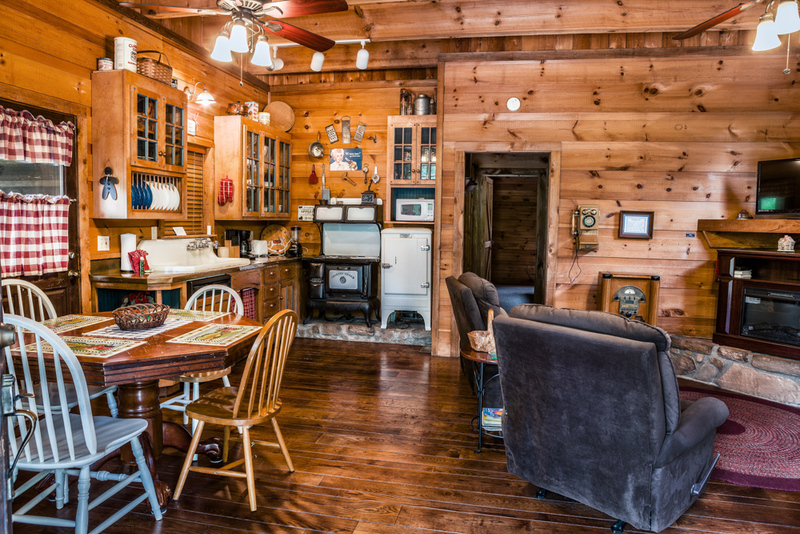 We’ve named this cabin, COUNTRY CHARM, and it certainly lives up to its name. 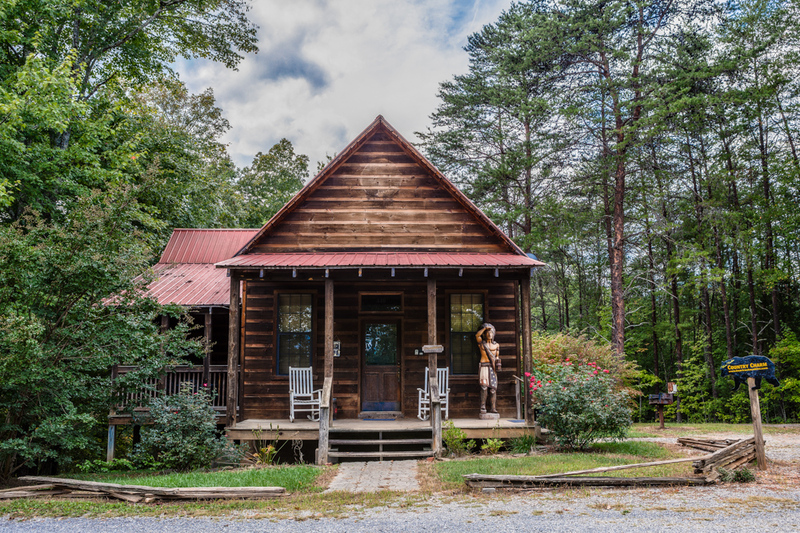 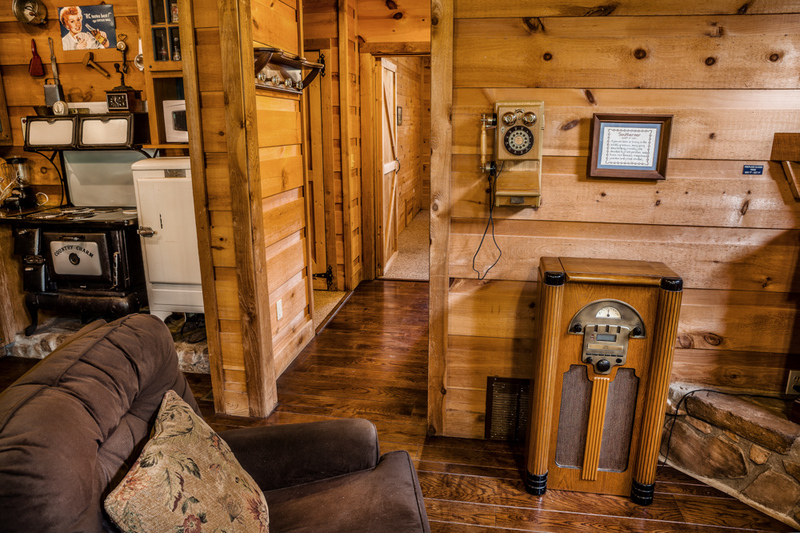 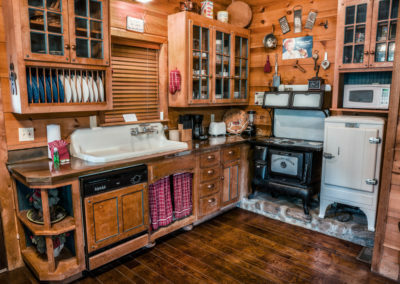 Filled with charm and antiques, this cabin whisks you back to the good ol’days, without ever giving up the modern vacation amenities we are known for. 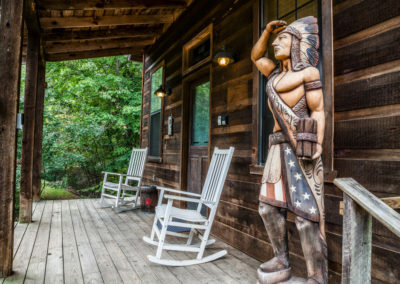 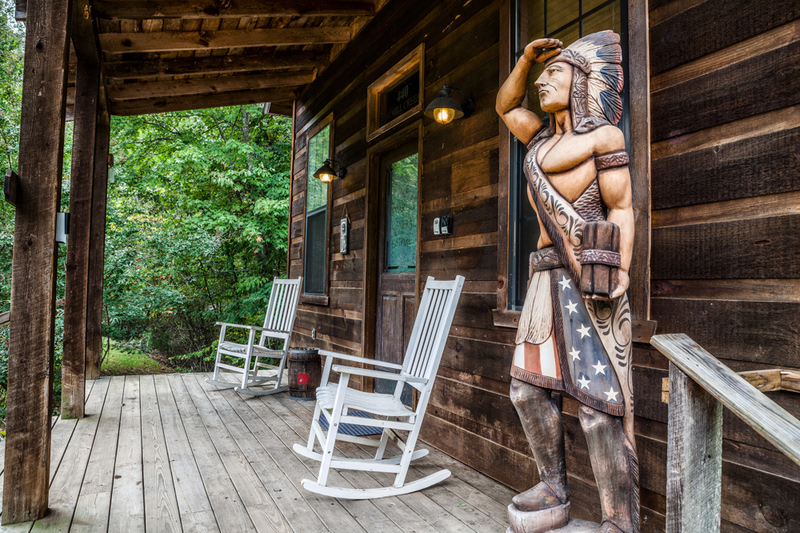 The charm starts the moment you pull up to the cabin, Complete with Rockers on the front Porch and if you listen closely you will hear the Steam Train at Dollywood throughout the day. 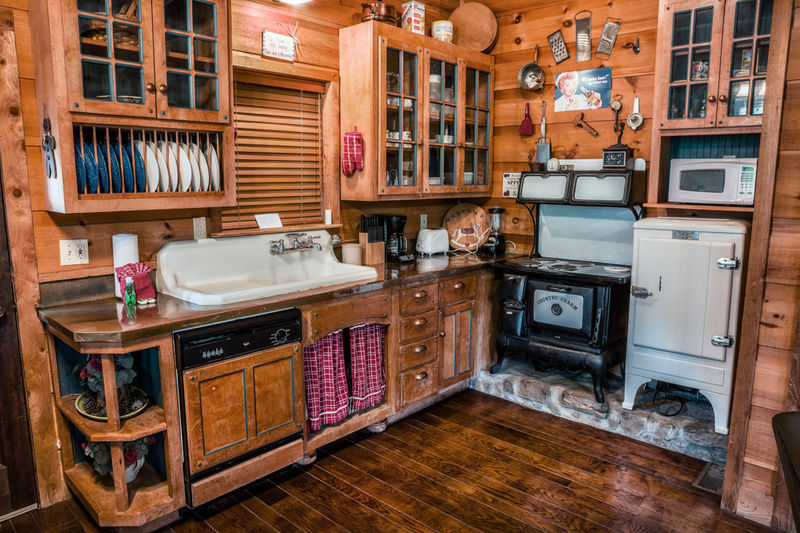 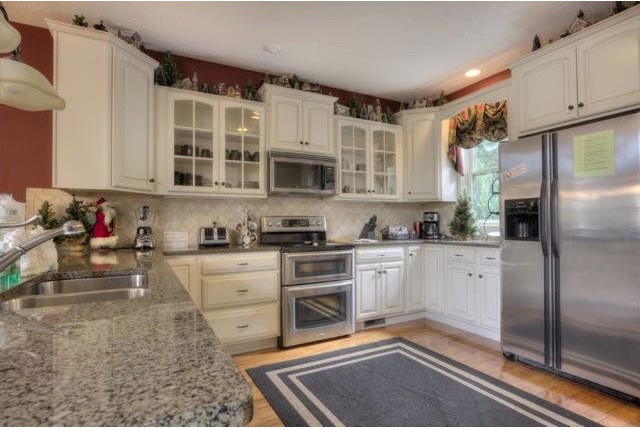 Once inside the decor and collected antiques will give you the feel of Days gone by, The kitchen features an old time stove and icebox, and a regular sized fridge of course! 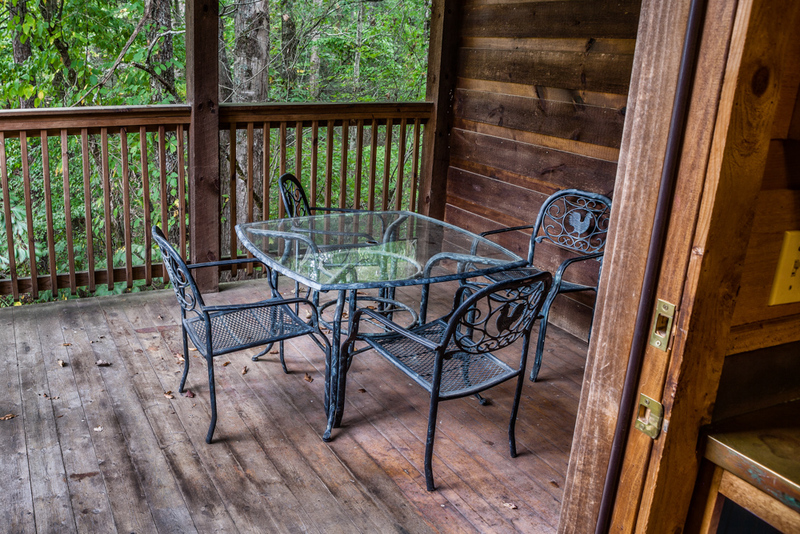 Just off the kitchen is covered private porch area with table and chairs- You can have your meal here or just sit and relax. 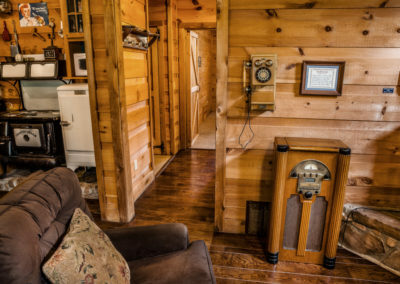 The Living room features modern stuff like the TV, but take a look at the working old Radio – Looks like the one the Walton’s gathered around at night to listen to News and Comedy shows. 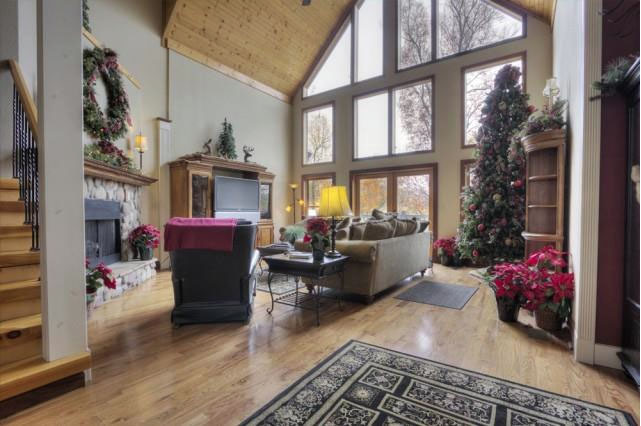 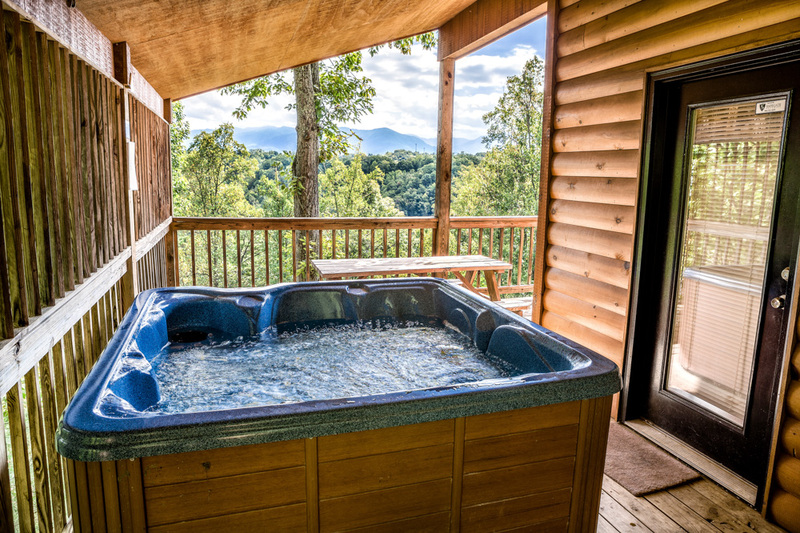 Its the perfect setting for enjoying a trip to the Smoky Mountains. 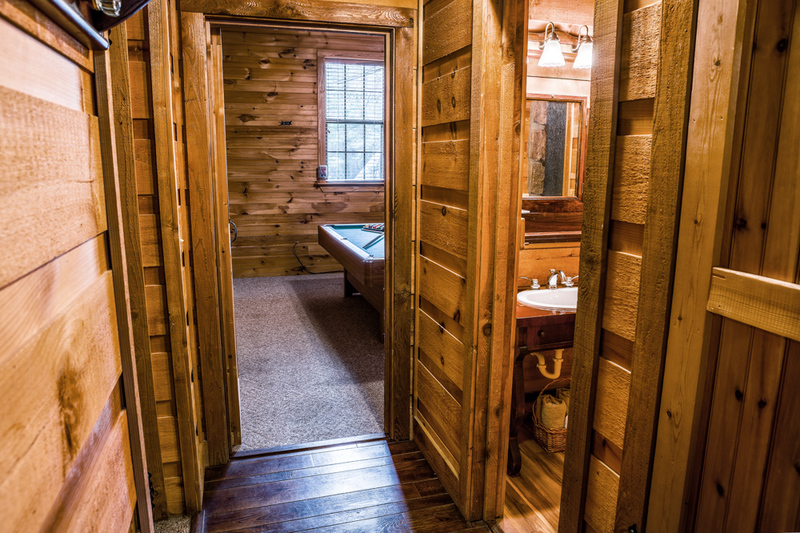 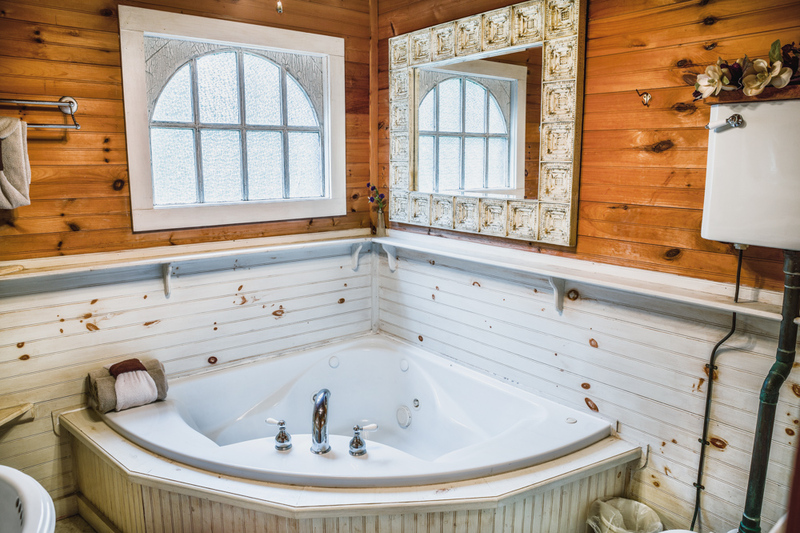 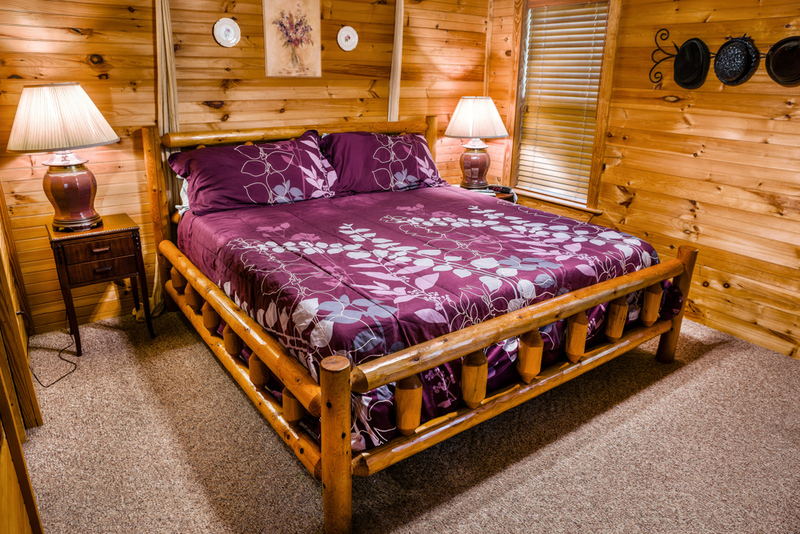 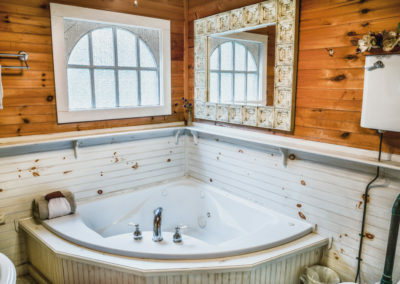 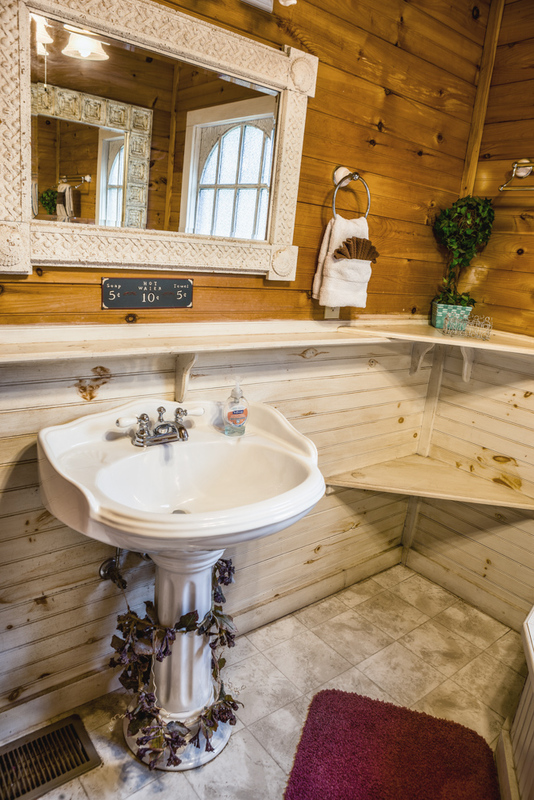 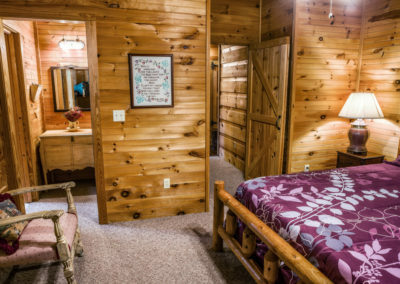 The Bedroom features a King sized LOG BED and is romanticly decorated in the charming country theme, The master Bath features a Corner Jacuzzi Tub. 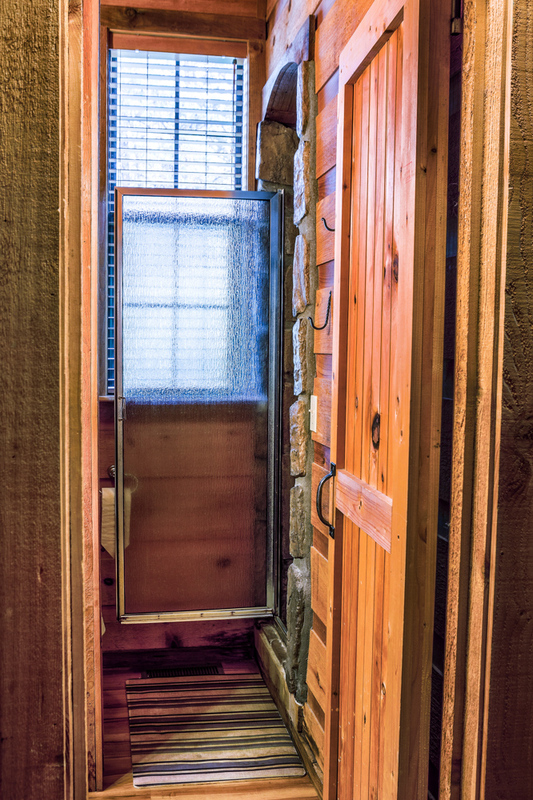 The 2nd bath has maybe the most enjoyed feature – A stone shower with a Full width water fall on one end and a regular shower head on the other, you can stand here and wash your cares away. 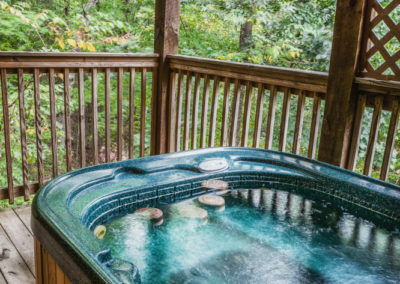 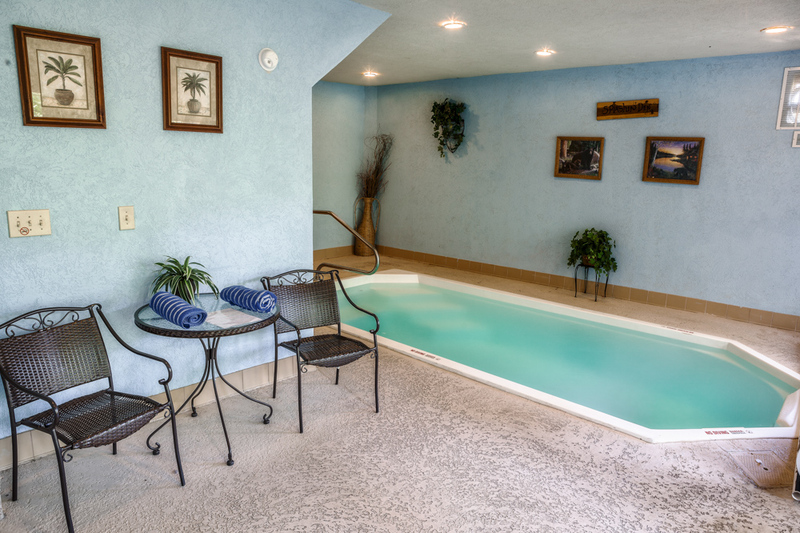 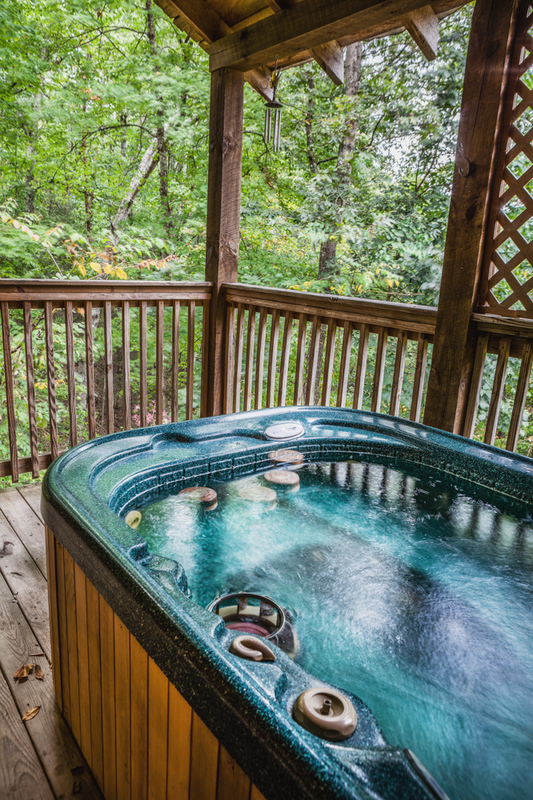 Just outside of the bedroom, on a private deck is a Hot Tub for your soaking enjoyment. 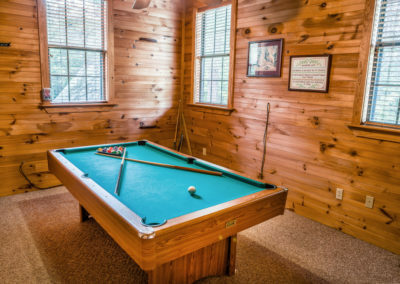 Shoot a game of pool on the regular Pool table or there is also a nice Bumper Pool table if you want to try that. 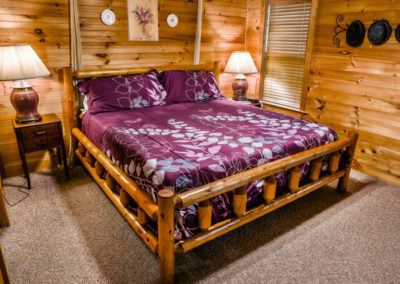 Great for your honeymoon or romantic getaway! 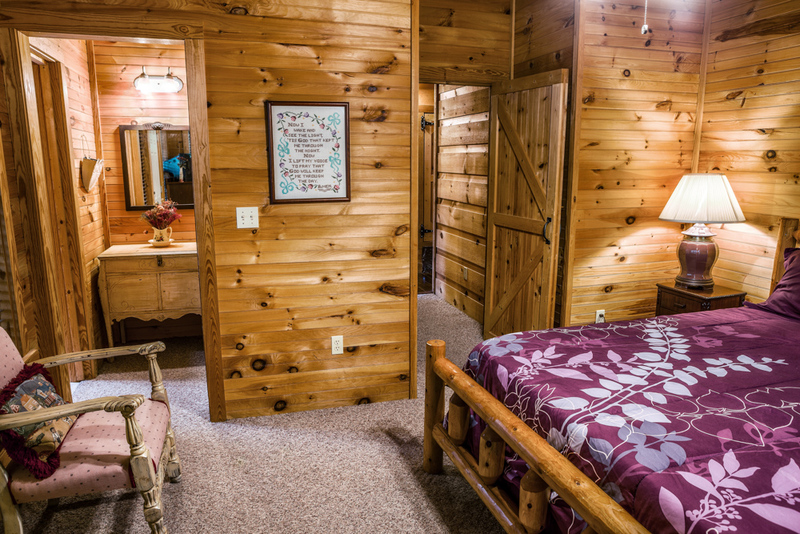 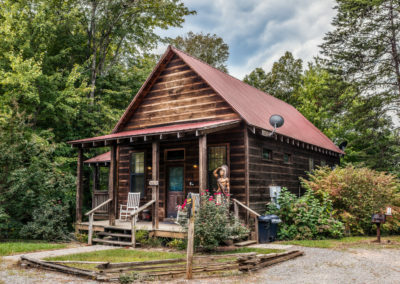 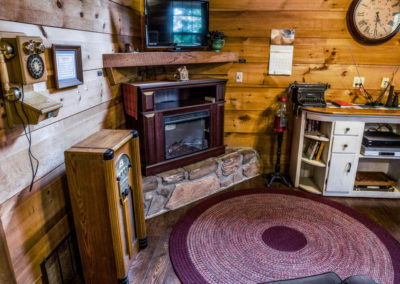 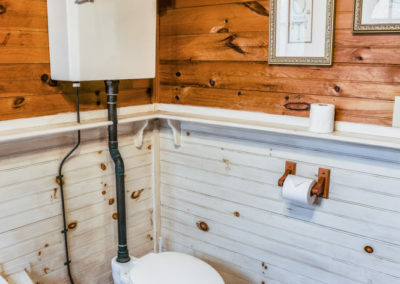 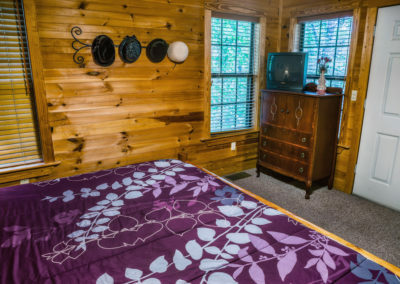 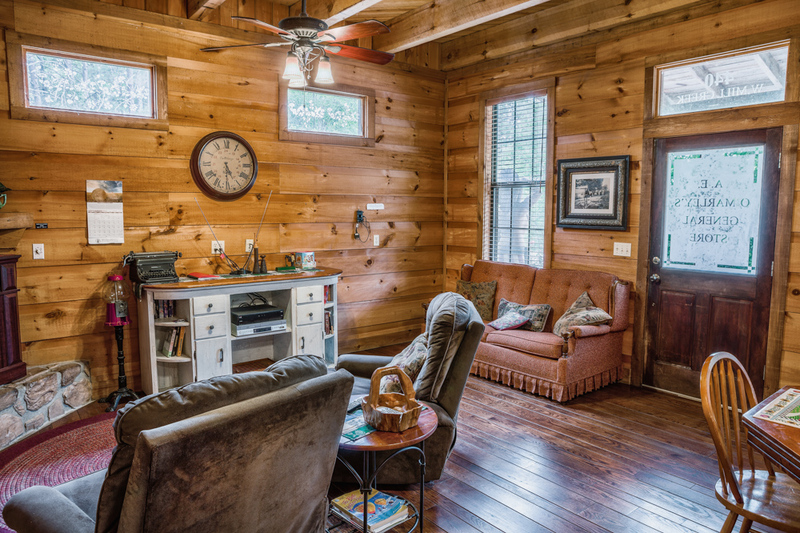 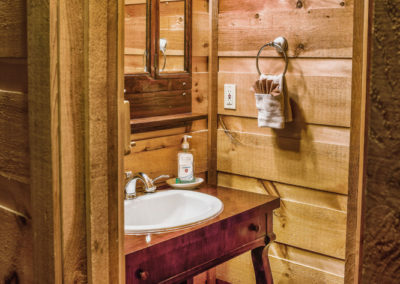 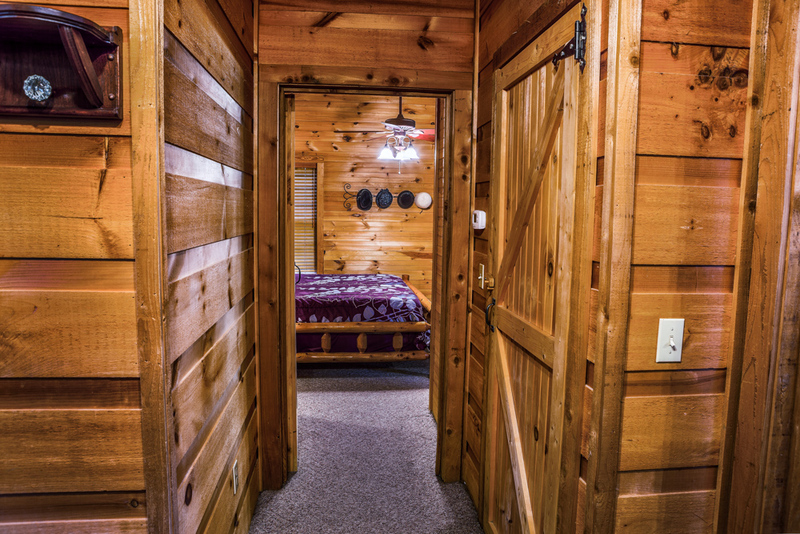 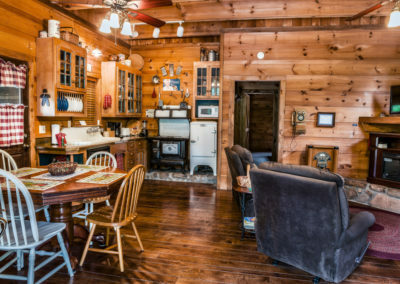 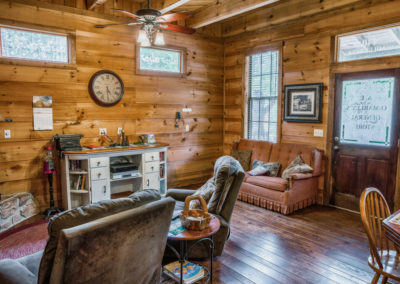 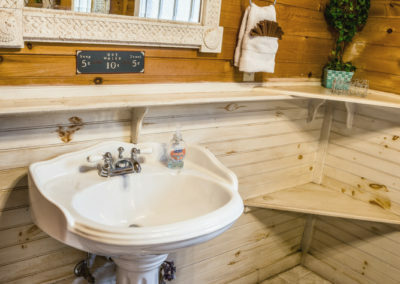 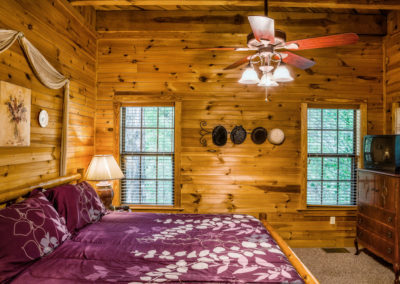 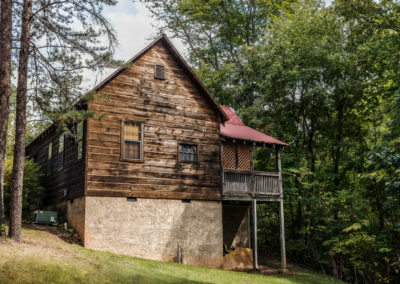 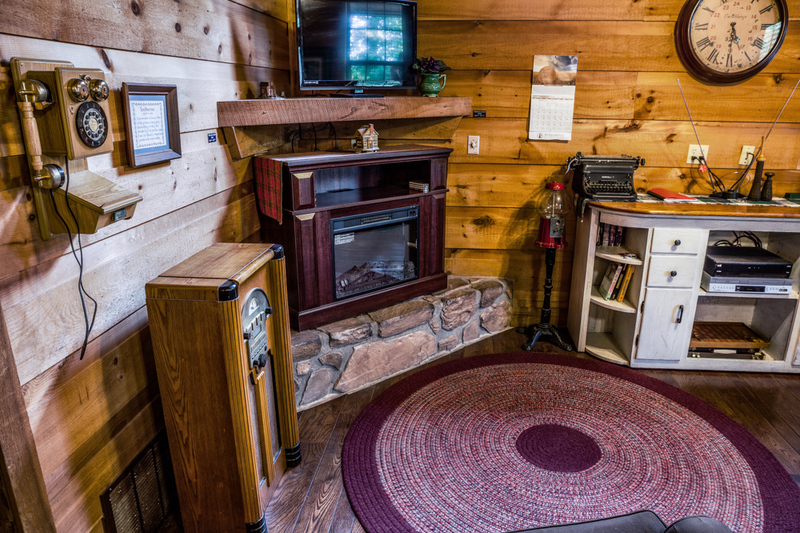 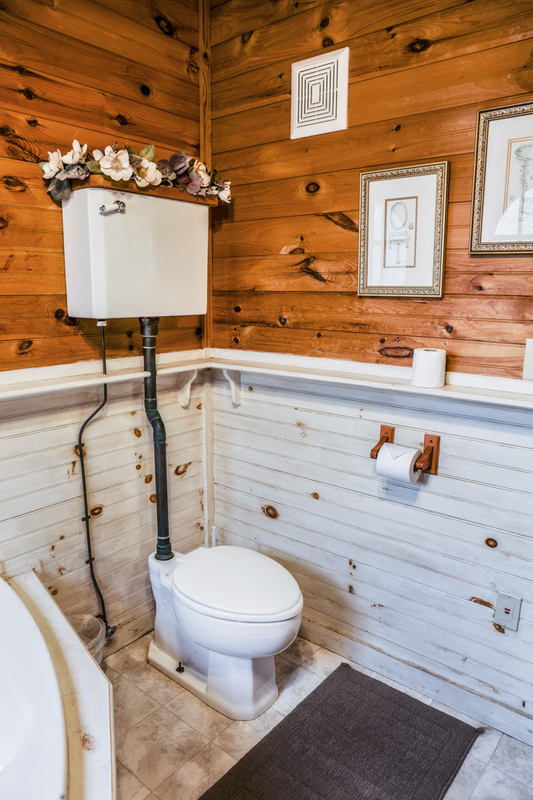 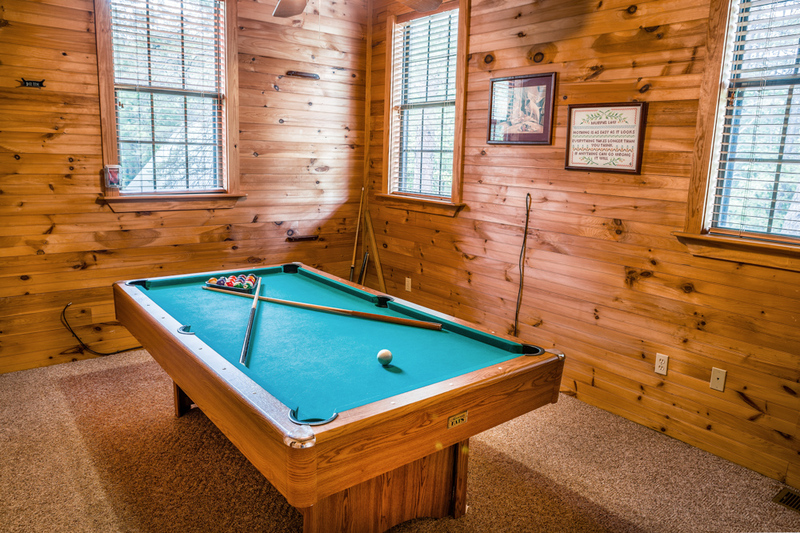 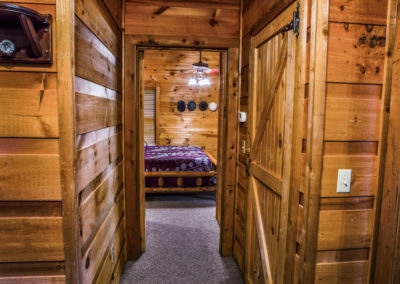 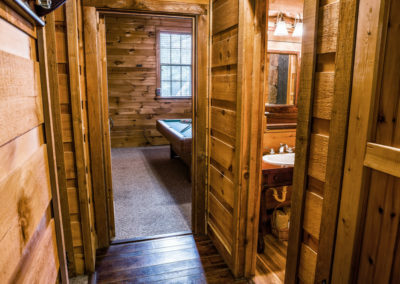 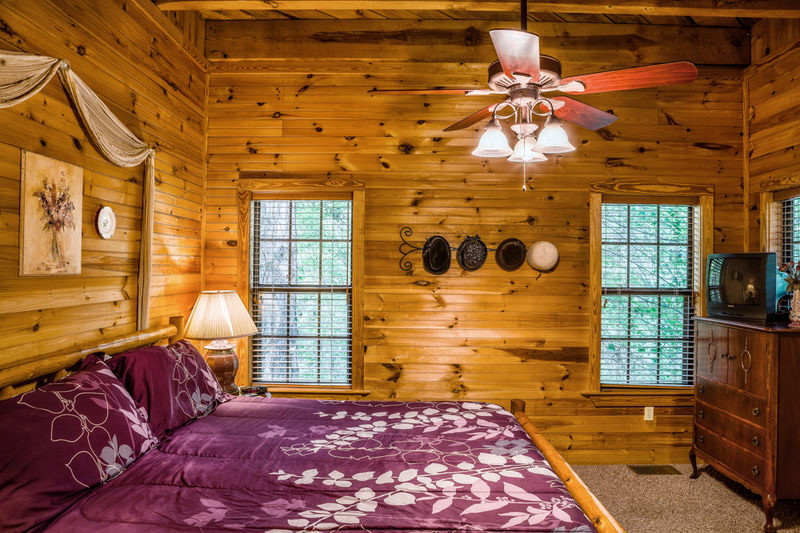 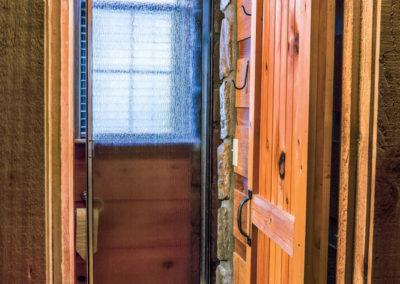 This Cabin is located just right, just a mile from the Parkway at Red light number 10 – easy access to DollyWood and Gatlinburg, Come here and enjoy your mountain vacation in this great Mountain setting and in our Old Time COUNTRY CHARM Cabin.